Waiting has just become the norm. Waiting to hear how an appointment went. Waiting to know what her counts are at. Waiting to see if the doctor clears her despite her numbers. Today there was a lot of waiting. And I just assumed chemo would be a no go. Her platelets take a pretty big hit with this new drug and even with a week off her platelets seem to like to do their own thing and recover when they feel like. Her platelets were 3 below the cut off and so her oncologist ended up clearing her for chemo. So she starts cycle 3 today. The final cycle before another important CT scan. We don’t know what happens after that. It all just depends on what the scan looks like next month. Is it the end of chemo? A new chemo drug combo? Will they put her on a PARP-inhibitor drug? We have no idea, the doctor has no idea until the scan is done. And I don’t know what to hope for anymore other than the obvious…a clear scan. So we just have to give it up to God and see what happens. Much to my shock mom got chemo today. The reason I was shocked may sound strange. When they did mom’s blood draw last week her numbers were pretty good. The nurse believed the double dose of chemo wouldn’t knock them down too far and said she would be surprised if mom couldn’t get chemo this week. Sooo because I thought she would get chemo this week it made me actually think she may not. Glass half empty, sure. But at this point I just try to keep my expectations low when it comes to chemo and then I get to be pleasantly surprised. So anyways, today is week 2 of cycle 2 and week 3 is just a week off of chemo. So technically she hasn’t completed cycle 2 but she has completed the chemo portion so I just consider it done. So next week is possibly a blood draw to check in with her cells and make sure everything is going good. 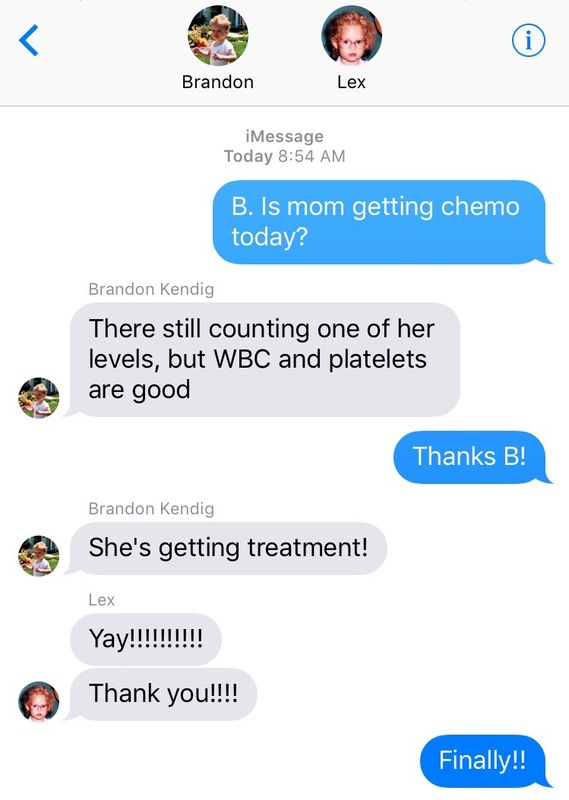 And if her good cells (hemoglobin, WBC & platelets) are still in that safe chemo range she will start cycle 3 the week of March 27th. When we were growing up mom would make the rounds finding each of us throughout the house telling us, “I don’t care if you’re eating, come sit at the table.” Family dinner time was important and the dinner table was where we came together. Last week I was reflecting on this. The five of us were sitting at the dinner table and we were there by choice. It had been a rough week and we just felt the need to be together. So we sat at the dinner table and laughed and made fun of each other and made jokes that would probably only be funny to us. And I went home that night and I felt happy. The same thing happened Friday night too. We all just sat there having fun with each other and Julian joined in on the fun and made some jokes. We’ve always been a pretty close family but we are closer now than we have ever been and I feel incredibly lucky for this. After five lonnnggg weeks mom was finally able to get chemo today. Today was a double meaning two different types of chemotherapy drugs. Her doctor adjusted the dosage for each of the drugs in the hopes her good cells would take less of a hit this time around. So we are back on the chemo train and just taking it one day at a time.